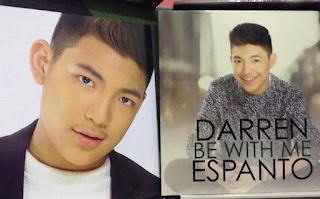 Dubbed as the country's Total Performer, Darren Espanto reveals yet another facet of his artistic versatility in his second album, "Be With Me". 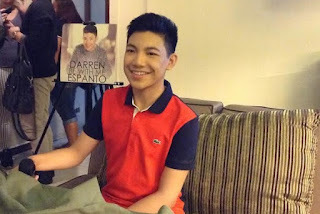 Darren showcases two of his original compositions for his growing number of fans and for his loyal fanbase, the Darrenatics. I wrote 'Hanggang Hi Hello' originally when I was eleven but then I changed some of the lyrics to fit my age now. And then 'Home' talks about just wanting to be home... and it's a ballad. In a press conference held at the Packo's Grill at Tomas Morato, Quezon City on June 8, we asked the teen idol whether or not he has other original compositions in store. Darren said he is halfway through composing another song, but he does not know when and if it will be ready for recording. "We'll see," he said with a ready smile. The album "Be With Me" contains 8 other tracks aside from Darren's compositions. These are Alam, Be With Me, Parachute, Starlight, Surrender, My Baby & Me, Talking 'Bout Love and 7 Minutes. The songs for the album were created by a curious mix of local and international songwriters from Singapore, Berlin, Netherlands, and more. The variety of songwriters gave Darren a chance to learn and develop during the making of the album. He said, "I got tips from each of the songwriters that I worked with." The first track of the album, '7 minutes', debuted at #1 on iTunes Philippines on the very first day of its release. Same goes for 'Starlight', which zoomed to the top of the iTunes Philippines Singles Chart upon its release. At 15, the Total Performer is setting his sights on accomplishing more in his music career. But that doesn't mean that he will forego his studies. In fact, Darren said he will also give time to his studies in the near future but he'll "cross the bridge when he gets there." He is inclined to go into the medical field and might just go take up nursing, just like his parents. Or, he said he might pursue becoming a doctor. What kind of doctor? Darren said without hesitation, "a cardiologist". I can foresee a future wherein a long queue of ladies are waiting for a check-up from their heart doctor, Darren. 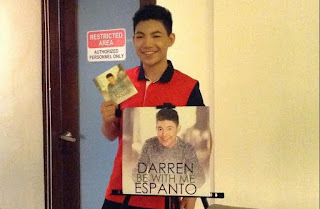 Be With Me is now available through digital downloads at Spinnr, iTunes, Apple Music, Spotify and VEVO. CDs are available at Astroplus and Astrovision outlets. Darren will also have a major concert entitled "D Total Experience" on June 25, 8pm at the Kia Theater. His special guests include Jed Madela, Maja Salvador, and G-Force. Tickets are available at Ticketnet.